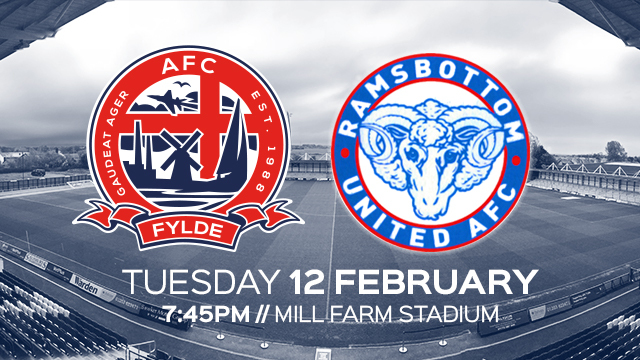 After last Tuesday’s frenzied encounter in the Harry Williams Riverside Stadium, AFC Fylde are back in action against Ramsbottom United after The Rams forced, yet again, another replay in The Buildbase FA Trophy. The Coasters turn their attention back to FA Trophy action on the road to Wembley after Saturday’s 1-1 draw to Maidstone United down in Kent. Ramsbottom United travel to Mill Farm hoping to maintain their current six-match undefeated streak, which includes last Tuesday’s dramatic game. The Rams have now forced five replays in The FA Trophy – however, tonight’s bout is decisive. This will be Fylde and Rammy’s second Trophy match. Nonetheless, Rammy and Fylde have met across five different competitions in the past. The first encounter dates all the way back to November to 2007, in Kirkham and Wesham FC days, where The Rams earnt themselves a 2-0 win in the second round of the League Cup. The most recent Coasters win was in 2012’s FA Cup First Qualifying Round duel at Kellamergh Park, which saw Fylde come out with a 3-1 win. Overall, The Coasters have a more successful record when facing The Rams with three wins accounted for in six past encounters. Nic Evangelinos was predicted to be a key player in the last match preview for the Rammy game and the tricky left winger proved just that – putting three past The Coasters despite Tuesday’s problematic conditions. Along with past Tuesday’s hattrick, Evangelinos has scored a total of 17 goals across four competitions. Considering that Fylde’s current defensive record is one of the best in the National League, the hat-trick hero has clearly proved himself to be problematic and is one to look out for in tonight’s match. After the Maidstone game, Dave Challinor spoke about fatigue considering the fixture congestion ahead of The Coasters. Fitness is considered as there seems to be statistical improvements from last season. Tonight sees another series of FA Trophy replays. Carshalton Athletic have forced a replay when facing Barnet away and therefore host The Bees tonight at The War Memorial Sports Ground. Maidstone United will host Salford City after their last 1-1 draw last Tuesday.